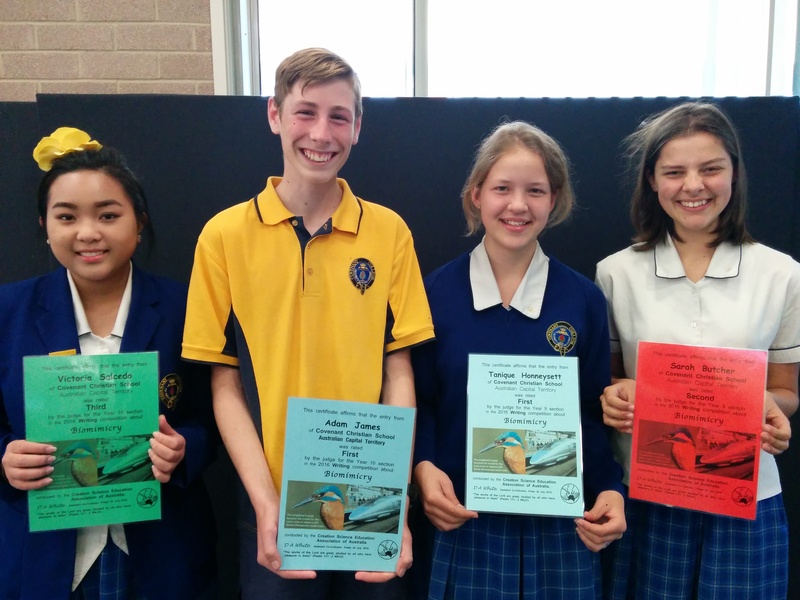 During Term 2, 2016 four Years 9 & 10 students entered the writing category of the nationwide Creation Science competition which involved researching and writing a report about How an Example of Biomimicry Derives from God’s Design. Sarah B – 2nd Place in Year 9 for her report on how people have copied God’s design of the cuttlefish for thermal cloaking purposes. Tanique H – 1st place in Year 9 for her report about God giving wisdom to people to make inventions that use His design of bioluminescence. Adam J – 1st Place in Year 10 for His report on how people have copied God’s design of the kingfisher’s beak to improve the design of fast trains. Victoria S – 3rd place in Year 10 for her report on how people have copied God’s design of dolphins to improve navigation of submarines by sonar.